It is fun to get a group of adults and children together and have an angel making session, there is no limit to the creativity that will emerge. This angel is easily made from different pastas, glue, and craft paint. It can be personalized by adding special things such as distinctive facial features or accessories held in the angel's hands. 2. Use fine tip marking pen to make facial features. (If you don't like your first try, make another face on opposite side and use the one you like best. 3. To make hair: dip back area of head into shallow dish of glue, then into dish of tiny pasta or coarse sand. 4. Glue on elbow macaroni for arms and bow tie pasta for wings. 5. Let dry for few minutes and then paint body and wings with white paint. Paint hair any color you choose. Use a small brush. 7. Finally, glue metal ring, or pipe cleaner fashioned into halo onto head. Sign by adding initials to the back of the wings. 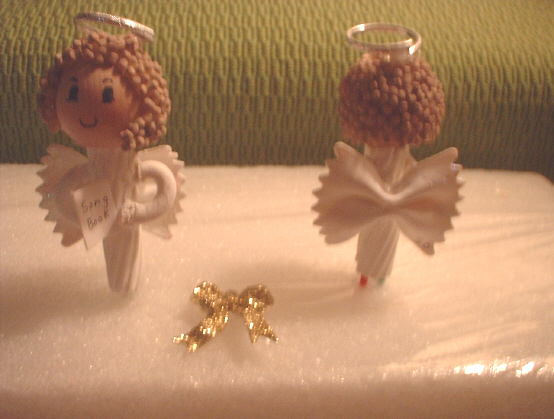 These angels also look wonderful when spray painted with metallic gold or silver and need no facial features. You can mount a whole batch of them on a Styrofoam base and spray a large number at once. Copyright © 2008 by Shirley Deyoe. All rights reserved.